Our pasta chefs start at midnight – mixing, rolling and cutting the fresh pasta. Whilst recipes are followed, one touch and our pasta chef knows whether the dough needs a dash of water or something else to achieve a perfect pasta strand. 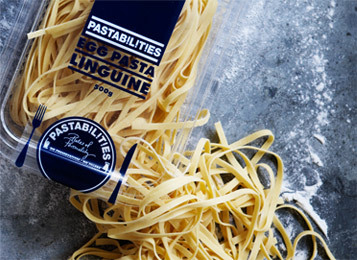 Durum semolina sourced from Australia’s finest wheat growers combined with fresh eggs gives our pasta its flavour and fine texture. When the dough is infused with fresh herbs or vegetables, the possible flavour combinations are endless.